Part of the mission of the Florilegium Program is to promote botanical art education both for established artists and for individuals interesting in becoming botanical artists. 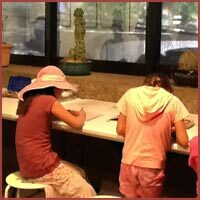 Between 2005 and 2014, in conjunction with the Arizona-Sonora Desert Museum’s Art Institute, members of the Sonoran Desert Florilegium Program presented classes related to botanical art. BOTANICAL ART IN PENCIL and CREATING A BOTANICAL PLATE introduced students to botanical art. BOTANY FOR THE NATURE ARTIST introduced art students to botany and how to observe and draw plants. ILLUSTRATING THE LEGUMES OF ARIZONA was a class given to prepare interested botanical artists to illustrate the book Legumes of Arizona: An Illustrated Flora and Reference being compiled by the Desert Legume Program. BOTANICAL ILLUSTRATION IN COLORED PENCIL and DRAWING PLANTS FOR A FLORILEGIUM were other classes given. Photos from some of these classes can be see here. A selection of student works from the classes is presented here. The STEMAZing project was launched in 2014 by the Office of the Pima County School Superintendent in Pima County, Arizona. It provides professional training for PreK to 12th Grade teachers to improve their STEM (science, technology, engineering, and mathematics) curricula. The STEMAZing Institute, a multi-day workshop held during the summer for educators, is sponsored by community and business partners. STEMAZing Workshop "Get to Know Your Sonoran Desert Ecosystem" - June 29 - July 1, 2015. In support of the Tucson Cactus and Succulent Society teacher education program, TCSS members along with scientists and researchers presented this 3-day STEMAZing workshop to 25 teachers at Pima Prickly Park. At this workshop, teachers were given information, classroom hands-on activities, lessons, and resources that would enhance and enrich educational experiences for their 750 students. 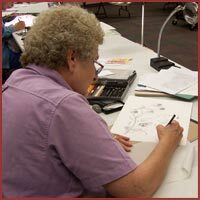 Margaret Pope, a botanical artist from The Sonoran Desert Florilegium Program, presented a session on teaching botany through drawing. Teachers were given handouts of the basic structures of a plant and a flower. To observe and understand the structure of a plant, the teachers were asked to draw the entire structure of a small prickly pear cactus, after which they briefly discussed what they observed in general about the plant. Margaret then reviewed a handout on the basic parts of the flower. 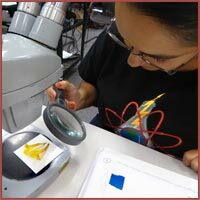 One cactus flower and one freesia flower were given to pairs of teachers, who were asked to draw and then dissect the flowers, draw and label their various structures, and make notes of general observations, such as the color and size. Finally each teacher was given a creosote leaf and a hibiscus leaf. A handout on leaf structures and characteristics was reviewed, and the teachers then drew each leaf, labeling their structures and noting the characteristics. Margaret encouraged the teachers to use these handouts and have their students draw the plants and their structures as a way of teaching their students botany. Photos from Margaret's workshop can be see here. More information about educational materials developed by TCSS can be found here. In 2013, the Sonoran Desert Florilegium Program presented the exhibit Botanical Art of the Sonoran Desert: Past and Present at the Arizona–Sonora Desert Museum's Ironwood Gallery. Supplemental educational materials were made available for interested visitors. The exhibit featured many intricate botanical plates accompanied by detailed explanations of the plates using botanical terminology that may have been unfamiliar to the visitors. In an effort to increase their understanding of botanical art and the botany behind it, a glossary of botanical terminology was available at the entrance to the exhibit along with a diagram of the basic structure of a flower. For children visiting the exhibit, an area was set aside for drawing and coloring. Pen and ink drawings of cacti by Evelyn Thornber, made available by the University of Arizona Herbarium, were compiled into a coloring book, Cacti of the Sonoran Desert . Also available for children was Can You Find the Plant Pieces?, a sort of botanical scavenger hunt handout. A number of botanical structures were grouped on a page with the challenge to find which botanical illustration in the exhibit contained the specific structure shown on the handout.